Home to one of the world’s youngest, fastest growing populations, Afghanistan faces challenges exacerbated by conflict, weak governance and cultural barriers, especially in the case of impoverished women and children. UNFPA programmes invest in reproductive health and rights, gender equality, and socioeconomic development; humanitarian assistance and youth issues are priorities in all three areas. Assistance is channelled to replicable programmes in provinces with high rates of poverty and maternal and infant mortality, and where communities are actively engaged in their development. HERAT, Afghanistan – By midnight, Khurshid, 35, was in serious trouble. 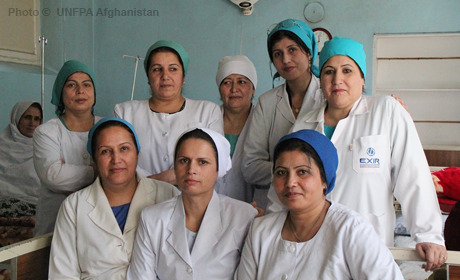 KABUL, Afghanistan – For 49 years, a traumatic childbirth injury left Noorjahan living in the shadows.